If you would like to create your own reed diffusers, a good place to start is to choose reed diffuser bottles that are appropriate – both for the room you want to use them in and the fragranced oil you want to hold within them. Reed diffuser bottles are available in many shapes, sizes and colours and enable you to create a unique piece for display in your home that can become a talking point in the room setting where you have placed it. Alternatively, choosing a pretty bottle that reflects the personality and taste of a friend or family member will allow you to create a gift that will be treasured. Begin by thinking of the oil and fragrance you want to place within it. What is the colour of the oil? 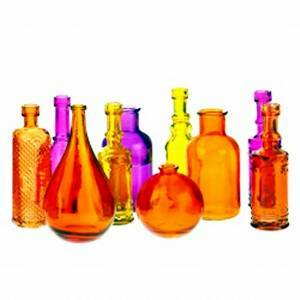 Will it look best in a clear glass bottle that will use the colour as a feature? Or will it look best in a container that is coloured to reflect the taste of the person for whom it is intended or the decor of the room where it will be placed? The shape of the vase chosen will also depend on the position where it is to be placed. If you want to place the bottle in a corner of a room where there is no possibility of it getting knocked or bumped, you could choose something very delicate and light weight. However, if the reed diffuser is to be placed on a table or in the centre of a room, it might be wise to consider a heavier container, perhaps with a wide or weighted base to prevent accidents and spills. Another thing to consider is whether a glass vase that is decorated will make a more suitable container for the type of fragrance you have chosen. Ceramic vases are also popular as reed diffuser bottles. If this type is chosen, be sure that the bottle is glazed on the inside as well as on the outside to prevent the oil from soaking into the ceramic material of the bottle. Next, be sure to choose a bottle that is tall enough for the length of the reeds you want to place within it. Choosing one that is too tall or too short will spoil the effect and could result in the diffuser being less effective at dispersing the fragrance in your room. Finally, the neck of reed diffuser bottles needs to be small enough to ensure that the fragrance from the oil is carried up the reeds and dispersed from these, rather than being evaporated out of the neck of the bottle. You need to be sure though that the neck opening is wide enough to allow the reeds to be displayed attractively in the bottle without bunching up. See our article on How to choose the best diffuser reeds for further information.